Jokes Down Town fundraiser on May 2 for reading-support charity ABC to Read. Some of the proceeds from this year’s Jokes Down Town event will be going to children’s literacy charity ABC to Read. The Friday, May 2, event at Sub89 in Friar Street will showcase the best unsigned singers, dancers, comedians and urban poets from Berkshire and supports the Countess Mountbatten Hospice Charity. 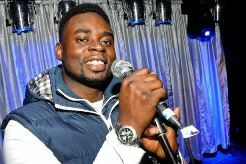 This year, organiser TJ Shiyanbola, aka rapper 4Fingaz, wanted to support a local charity as well. The charity is on the lookout, both for schools where pupils need help, and new volunteers. For more on Jokes Down Town or to become a sponsor of the event email TJ Shiyanbola at fingaz2008@hotmail.co.uk.